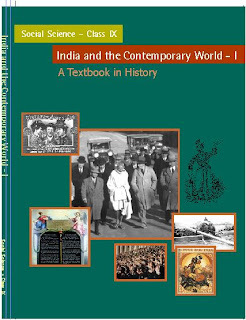 The much maligned, misunderstood and maltreated subject of history can finally be seen as being given some respectability, credence and relevance thanks to the new history textbooks brought out by NCERT. I personally see some hope for history with these new text books which seeks to present history not so much as past information but as a mode of inquiry. History in these books comes out as more contextual, multi-dimensional and much more than mere political narratives. For example the class IX and X books are a sheer delight as for the first time, students are sought to be given some exposure to issues connected to cricket and nationalism!!! Howazzat!!! By including chapters on pastoral society and the effect of colonial forest policy, contemporary environmental issues have also been sought to be historicised. The chapter on clothing emphasizes the political and economic implication of Gandhi's use of Khadi. Then there are chapters which give insights into literature and art during the nationalist movement. 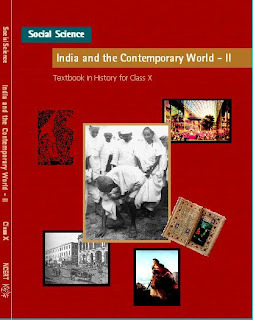 Even in chapters on Gandhi, French Revolution, Nazism etc which are as such treated in other text book publications affiliated to educational boards other than CBSE as well, the emphasis is not on giving all the boring details but in delineating the broad contour and features which characterised these epochs. But nevertheless these books I would say have certain problems - problems not intrinsic to these books as such but more extrinsic in ways the book is likely (in fact it already is) to be received by the community of teachers and students. Firstly how many school teachers in India are competent to tackle these chapters in a way that these chapters warrant? From what little interactions I have had with few teachers, they all complained that the chapters in Class IX and X books were far too complicated for their liking. They were not too sure if they have understood the chapters themselves very clearly. If the teachers themselves are not clear about these topics and themes then how does one expect them to put it across to students? One can very well sympathise with their predicament. For how many school teachers have a clue about history being anything other than names, dates and events? That history is not so much a study of the past but more an attempt to understand the present in light of the past is something that escapes the attention of the majority of school teachers. Therefore it is imperative that teachers at least are well informed about current issues in the world. But how many school teachers even read newspapers in the first place to keep themselves abreast of contemporary social, economic and political developments? As such school teachers who are supposed to be one of the most well informed segment of the society happen to be the least well informed and most certainly the social science teachers. And even when they are so, given the skewed perspective offered by the dominant media which reinforces certain received wisdom and understanding on our past and present, they would hardly be in a position to appreciate the nuanced study which have been undertaken in the writing of these new textbooks. NCERT says that refresher courses are afoot to equip the teachers to deal with such issues. How effectively they are going to be carried out, remains to be seen. Secondly though I'm trying to contextulaize history myself similar in approach adopted by these textbooks but like I mentioned in my previous blog entry, many students themselves appear to be resistant to any approach which seeks to bring in some level of rigour and complexity to the themes. As per my experience, many students feel and want history to be conventional, straightforward as always, which lends itself to easy mark scoring. In this context are the new NCERT books expecting too much from both the students and teachers? Are these books 'children appropriate' i.e. cognitively and emotionally proper? Of course my contention is history has to go beyond the story and linear narrative approach. If history is to be made relevant some degree of complexity has to be brought in. But how the complexity is dealt with by the teacher is the moot point. Thirdly, I'm still awaiting the guidelines by NCERT/CBSE for examinations. For like it is and has been the case with most of the history examinations based as they are on cramming, if the exams are going to be again based on memorisation and standard questions format, then the whole purpose of these books will get defeated. These new textbooks are basically based on the premise that events do not happen in neatly defined 'causes' and its impact again cannot be neatly classified into 'consequences'. Examinations, public examinations in particular, because of their own compulsions and pressures hardly seek to discover any understanding of the students. All the chapters are standardised, prioritised in terms of marks, and then sample question papers guide the students to prepare well for the exams. The idea is to ensure that students get 'good marks', their understanding and opinions be damned!!. Also even when students end up writing well informed answers which express their personal opinion , are our teacher- evaluators, used to corrections based on answer keys, competent to judge such answers where a student has given answers without using the usual keywords or catch phrases? If the new textbooks are subjected to such modes of examination preparation and evaluation, the whole effort, however noble the intentions may be, will be wasted. I hope it makes a difference but I am afraid the way history has been taught all these years in most schools in India has so much inertia that NCERT might want to get back to their older versions by popular demand! There are certain areas where NCERT needs to focus. One critical aspect is - while shifting the approach of narrative history to thematic history, it has to be kept in mind that the choice of ideas (historical concepts) have to precised and meanigful to children. There has to more case studies pertaining to concepts and then linking with the wider world. From my experiences I have noticed that children dont understand the concepts well though they are good at memoraizing narrative facts.